Background Pharmacists’ involvement in outpatient dialysis centres in Australia is currently limited, despite the positive contribution of pharmacists to renal patients’ medication management and health outcomes outlined in the literature. An expanded role for pharmacists in this setting may be required as a consequence of the increasing burden of renal disease in the population. 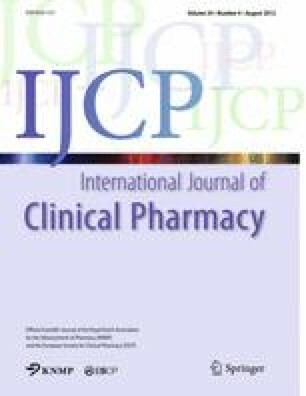 Objective To explore renal-specialised hospital pharmacists’ intentions to implement pharmacy services in outpatient dialysis centres. Setting Australian renal-specialised hospital pharmacists. Method Semi-structured interviews were conducted with a purposeful sample of renal pharmacists recruited through the Society of Hospital Pharmacists of Australia Renal Special Interest Group. The interview guide was developed based on the theory of planned behaviour. To identify behavioural intention, the three components of the theory—attitudes, subjective norm, and perceived behavioural control—were explored. The interviews were recorded, transcribed verbatim, and thematically content analysed following a qualitative approach. Main Outcome Measures Pharmacists’ views on their potential involvement and perceived ease or difficulty in implementing pharmacy services in outpatient dialysis centres. Results Thirteen renal pharmacists were interviewed until data saturation achievement. The following services for this setting were suggested: medication reconciliation, medication review, patient education, promotion of compliance, involvement in protocol development with subsequent anaemia/phosphate management. Pharmacists demonstrated positive attitudes towards the implementation of the services. Outcomes expected included benefits to patients, the renal team, and the pharmacy profession, as well as economic savings due to dose optimisation and improvement of patients’ adherence. Subjective norm was favourable meaning that nephrologists, nurses and patients were expected to be receptive towards future pharmacy services. Barriers pointed out for the implementation comprised: funding, hospital administrators’ approval, time and staff shortage, academic training, relationship with physicians, and attitudes of pharmacists, renal team, and patients. Facilitators mentioned by respondents included: having an interview room with access to information sources, consent from the team, access to patients’ profiles, and a full-time pharmacist with a clearly defined role. Conclusion Pharmacists showed positive attitudes, favourable subjective norm and strong perceived behavioural control, which originated a clear behavioural intention to develop pharmacy services in outpatient dialysis centres. The potential barriers and enablers outlined should be taken into account, as well as the holistic approach for the successful implementation of cognitive pharmacy services. We would like to acknowledge the invaluable contribution of Dr. Eleonora Feletto in the development of the interview guide and pre-testing of the research instrument. In addition, we would like to thank all the renal pharmacists who participated in this study for sharing their views and experiences. Financial support received from Fundaçao para a Ciencia e a Tecnologia, Ministry of Education and Science, Portugal (Doctoral Grant reference number SFRH/BD/43999/2008). Cohen D, Crabtree B. Qualitative research guidelines project. Available from: http://www.qualres.org/index.html. Cited 28 Dec 2011. Commonwealth of Australia, The Pharmacy Guild of Australia. The fifth community pharmacy agreement between the Commonwealth of Australia and the Pharmacy Guild of Australia. 2010 [cited 7-Sep-2011]; Available from: http://www.health.gov.au/internet/main/publishing.nsf/Content/C3DB799DB360AF0CCA25772000249FA8/$File/5CPA%20Agreement%2005%20August%202010.pdf.